Summary: Computer historian David Greelish thinks that Apple should build a corporate museum on its new campus. It would be a great way to celebrate the dent that Apple created in the universe. I thoroughly enjoyed computer historian David Greelish’s post about why Apple should build a corporate museum at its new campus and I agree with his premise. Apple needs to build a public museum to celebrate its past and present. It also needs to create a dedicated public space at the new campus. A space where visitors can spend a couple of hours learning more about the company they respect, and about the past products and leadership which brought Apple to the here and now. A wonderful place for visitors to relax and learn about Apple’s exciting past, while standing in the exciting present, and future of the company. If you’ve ever visited The Mother Ship in Cupertino (on anything other than official business, that is) you may have left disappointed. Short of taking some photos of the sign out front and visiting the outmoded Company Store there really isn’t much for a visitor to see or do at 1 Infinite Loop. 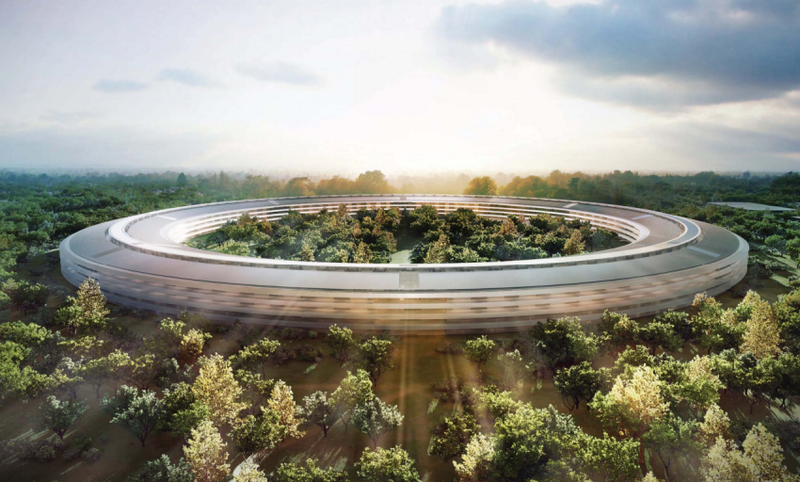 Apple’s planned new corporate campus (photo gallery) is the perfect opportunity for it to celebrate the dent that it created in the universe. Jobs famously scrapped plans for a corporate museum in 1997 and gave the archives to Stanford, but I’m sure it would oblige if Apple politely asked for a few of the key items back. In addition to an archive, one wing could have a display containing a working sample of every Apple product ever made. Getting these would be easy as most Apple users have their own personal Apple museums tucked away in attics, basements and garages and most would happily donate their Apple relics to the museum in exchange for a small mention on the plaque. 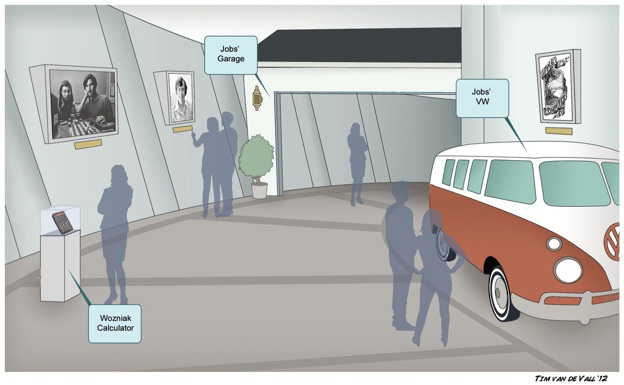 I think that the idea of a corporate museum would gain more traction if it were located in an out-building on the periphery of the new Apple campus with its own visitor parking lot, facilites, etc. The last thing that Apple needs is a high-traffic, tourist-friendly museum that’s actually “inside” Apple’s sacred (and secret) hallowed halls. Talk about a security nightmare! If the museum were located on a small parcel of land on the perimeter of the new campus, with its own entrance, well away from the employee access roads, it might gain some support from senior management. Apple could also build a massive, reference, flagship retail store on the perimeter of the new campus that would rival the San Francisco and New York City stores. It would be like mecca for Apple geeks. Apple could use it to beta test new layouts, floors, ideas etc. Heck, while we’re spending Apple’s money, it could build a nice amphitheater for musical performances — Jobs always loved music. Don’t get me wrong, I don’t think that Apple owes anything to its customers on its corporate campus — especially not an inane shrine or amusement park — (it is a place of work after all) but an Apple museum done right would elevate the company’s brand awareness and build an incredible amount of goodwill with customers. Greelish cites the Mercedez-Benz Museum as an excellent case study. In a follow-up to his original post Greelish makes his case for why Apple should take a look back (even though Jobs didn’t) and I couldn’t agree more. A tasteful museum on its new campus would be a great way for Apple to celebrate the company’s achievements and to honor its past. This entry was posted	on Friday, April 6th, 2012 at 3:10 pm	and is filed under Information. You can follow any responses to this entry through the RSS 2.0 feed. Both comments and pings are currently closed.